July has been a very good month for me, more of which later. I start with another illustration of Vampirella by Manuel Sanjulian. There's a lot going on in this picture and I like it a lot. I received a couple of big parcels this month, both of which pleased me immensely. First up was all of the figures I'd ordered from Bad Squiddo Games (BSG) for their Ghosts of Gaia 2 Kickstarter project. 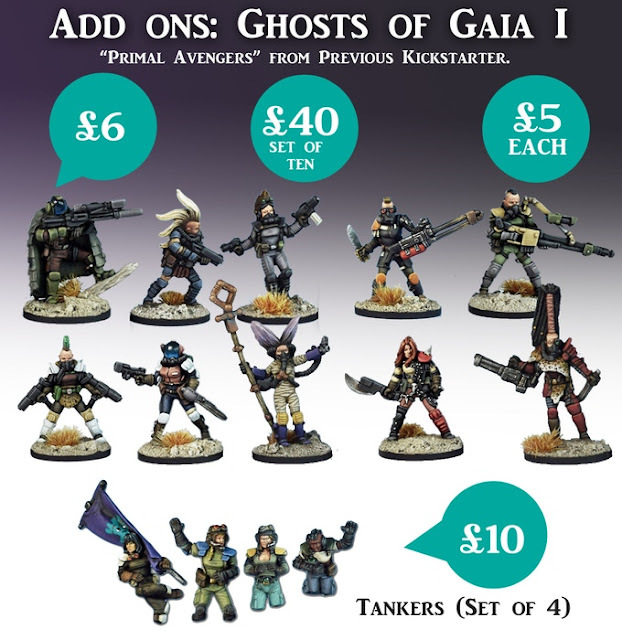 I missed out on the first Ghosts of Gaia Kickstarter but Annie kindly offered the figures from that set as a stretch goal for this later Kickstarter. This Kickstarter was launched last year but delivery was delayed for many months. This did not bother me at all because Annie Norman, who runs BSG, kept her backers well informed about the reasons for the delay, which was much appreciated. Communication is so important and made me much more understanding towards her problems. Illness, moving house and moving business were all reasonable causes for the long delay. I have dealt with BSG before and have always had great service from them and Annie is a true star. The Ghosts of Gaia figures are all females, which is something BSG specialises in. I've already painted a few of them. Reviews of this range of figures will appear on my WOIN blog due to them being sci-fi themed and very apt for inclusion in my The Ace of Spades Campaign. The figures that I ordered from the Ghosts of Gaia 2 range. 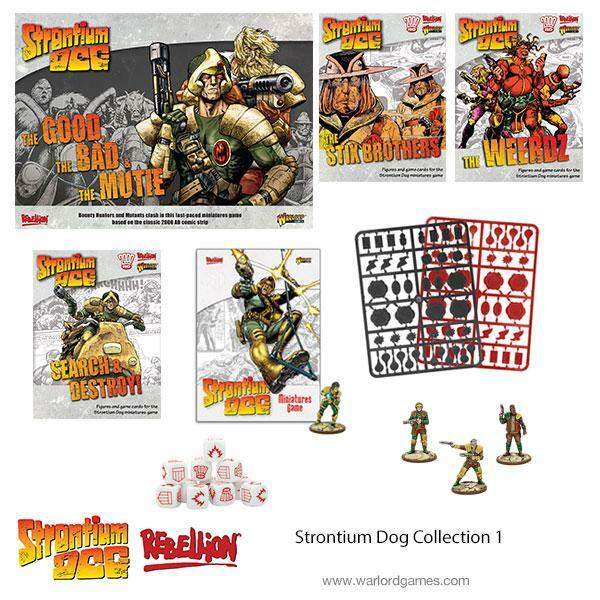 The other big parcel I received came from Warlord Games and it was the Strontium Dog Collection 1, which included everything that was produced for this brand new sci-fi skirmish game based on the series of stories from the 2000AD comic, starring Search/Destroy Agent, Johnny Alpha. I've been collecting 2000AD ever since its first prog and the Strontium Dogs stories have always been a favourite of mine, so therefore this game and range of figures was a must have buy for me. I'll say now that I was not disappointed. The figures are very well sculpted (apart from Wulf Sternhammer who has a very badly sculpted and positioned right arm). The rules are easy to understand and fit in so well with the theme of the game. I won't go through the rule mechanics here but look out for my first Strontium Dog batrep which will appear very soon. I'll explain the rules then. I'm in the fortunate position of owning all of the old Wargames Foundry and Heroclix Indyclix Strontium Dog figures (all painted) and my Battle Systems Shanty Town and Sci-fi Terrain sets are just tailor-made for this game. So using them, I'm able to run a game very soon. My first game will feature Johnny Alpha, Wulf Sternhammer and Durham Red going up against five (yes, five!) Stix Brothers. That works out at 50 Notoriety Points per side, which is the recommended total for starter games. If you fancy dipping your toes into this game you can buy the rulebook, dice, tokens and figures separately. The Good, The Bad & The Mutie is a better option, as it gives you the 112 page rulebook, a 12 page scenario supplement, 8 metal 32mm scale miniatures, 2 sprues of plastic tokens (red and black), 36 game cards, 6 character cards, a laser-cut MDF solar farm, 2 six-sided dice and 8 2000AD dice, all for £50.00, which is pretty good value for money, especially as some of the items like the cards and solar farm, are only available in this set. I went for the all-in option, simply because I wanted everything. So I got extra dice and counters and 12 more miniatures. Warlord Games already have the second wave of figures previewed for this game up on their website, which you can pre-order now. Delivery is expected in mid-August. I was most pleased to see that Durham Red is included in the second wave as she is my all-time favourite 2000AD character. Judge Dredd comes second. Once again, I'll be ordering everything including two boxes of the Build-a-Mutie sets, so I can make use of all of the components in these sets. You can probably tell that I'm very excited by this game. I don't do themed months on my blog, unlike some other bloggers (Blaxkleric :-)) but I can say that August will definitely be Strontium Dog month. One thing that struck me when I was reading the rulebook is that it could potentially work for other 2000AD stories. It would certainly work well for small-scale skirmish games of Judge Dredd, Rogue Trooper, ABC Warriors and Bad Company. I know that Warlord Games hold the licence to produce games for all of the 2000AD stories, so it could happen, especially if Strontium Dog is a big success... and I see no reason why it shouldn't be. Obviously the main focus of my figure painting for August will be getting the Warlord Games Strontium Dog figures completed. The three Stix Brothers are already finished and I'm about half way through the rest of them. I've made and painted five of the seven items for the solar farm - the watch tower (which I've converted) and the four solar panels. Oh, and I'm also painting all of the counters. Work will continue on my Wild West figures and sci-fi figures. I've made good progress with the painting of my Black Scorpion Tombstone figures and now have their complete set of figures for this range. Yay! Earlier this month, I received the second supplement for Dracula's America, called Forbidden Powers, along with all of the new figures designed specifically for it - three new factions. Finally, I want to mention something that has made me VERY happy this past month and that is the TV series of The Vampire Diaries. With the excessive and over the top coverage of sporting borefests like the World Cup and Wimbledon I needed something I could watch and enjoy on a daily basis on television. Now I have been interested in buying The Vampire Diaries series ever since it first aired in 2006, but I kept holding back because I wanted to wait until the series ended so I could buy all of the series in one boxed set and watch every episode back to back. In addition, I didn't want to buy the complete series boxed set as soon as it was released because I've found if you wait a year or so the price drops considerably. So once the boring football began I ordered the eight series complete boxed set of Blu-ray DVDs for about £60.00 from Amazon UK. With each series running to 22 episodes (although series 8 is only 16 episodes long), plus loads of extras and special features that is a hell of a lot of viewing. So far, I have seen the first three series and I was hooked after episode 1. Series 1 was very good. Series 2, however, was just amazing and series 3 has maintained the same high standards. This is a series which improves with each successive episode. As you'd expect with a name like Vampifan, I love anything to do with vampires and this series is so addictive, it ranks alongside Angel and Buffy the Vampire Slayer as my favourite vampire shows. Indeed, it could end up being my favourite TV series of all time. I am hooked on it and I couldn't be happier! As soon as I saw this set of The Graceful Seven from Great Escape Games' Dead Man's Hand range, I knew I had to buy them. 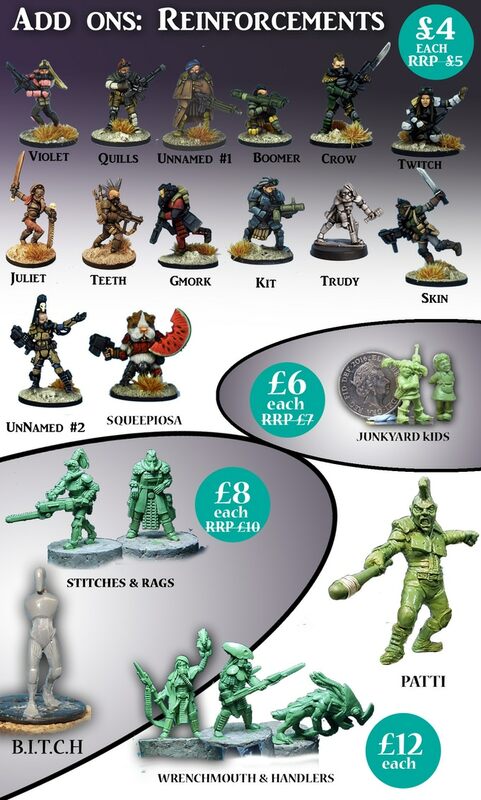 They are listed under the DMH Collectibles (Stronghold Terrain) section and they cost £32.00 for all seven figures. A group of gunfighter saloon girls was just what I wanted, although I was a bit surprised they weren't called The Saucy Seven! I guess The Graceful Seven is more tasteful.The one thing that I was slightly concerned about is no scale was given for them. However, all was fine when I received them and discovered they were about 30mm tall. I named them all and gave them stats for Six Gun Sound. Let's have a closer look at them. At the far left is Goldie "Dusty" Cole, a Rep:5 Gunslinger with the Marksman and Tough Attributes, who is armed with a 12 Gauge Scattergun. Second from the left is Lydia "The Cheat" King, a Rep:4 Gunslinger with the Marksman and Expert Gambler Attributes, who is armed with a Smith and Wesson .32 Pistol. Moving on, is Irene "Lucky" Fry, a Rep:4 Gunslinger with the Marksman and Lucky Attributes, who is armed with a Colt .45 Peacemaker Pistol. In the centre is Grace "Big Gun" Mullen, a Rep:5 Gunslinger with the Marksman and Quick Reflexes Attributes, armed with a Long-Barrelled Colt .45 Buntline Pistol. The plump red-headed lady is Abbie "Brawn" Savage, a Rep:5 Gunslinger with the Marksman and Brawler Attributes, who is armed with a 12 Gauge Scattergun. She is my favourite figure out of this group. 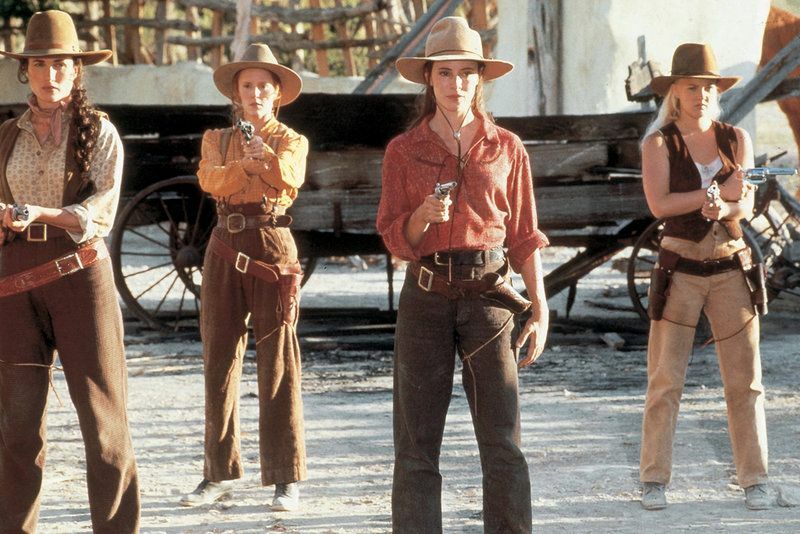 Second from the right is Susie "Shootout" Lester, a Rep:5 Gunslinger with the Marksman and Crackshot Attributes, who is armed with a Colt .45 Pistol. Finally, is Genevieve "Songbird" Hogan, a Rep:4 Gunslinger with the Marksman and Resilient Attributes, who is armed with a Colt .45 Pistol. Note that these are all Grunts and that I haven't nominated any of them as the Star Leader. I had planned on making Grace "Big Gun" Mullen the leader but when I was checking out the Knuckleduster Gunfighters' Ball range of figures I saw this figure to the left. She is called "California Kate" and I thought she'd be a perfect leader for this gang, although if I did add her I'd have to rename the gang. So, the gang will now be known as The Elegant Eight. I could have made these ladies a gang of outlaws but I prefer the idea of them being Gunslingers in the style of The Magnificent Seven. I plan on basing them in the Sassy Gal saloon, made by 4Ground, a most impressive building. As for the figures, they are very beautiful sculpts and look quite delicate. I do like that they come with various weapons instead of all being armed identically. I should point out that there is one potential problem with them and that is they come with separate hands and weapons. The hands have very small plugs at their wrists to fit into very small holes on the wrists of the arms. I glued them with superglue and when the glue was dry I added more superglue for extra strength. Mine fitted together better than I expected but it could be a problem to some. Be warned! I'm busy painting "California Kate" right now and she'll be a Rep:5 Gunslinger Star with the Born Leader, Marksman and True Grit Attributes. I am very much looking forward to using them in a batrep but that will be later rather than sooner as I've yet to get the Sassy Gal Saloon. However, it is high up on my "to buy" list. In my last post I showed off my old collection Hinchliffe Mexican Banditos, which I had rebased and touched up their paintwork. At the same time, I did the same to my smaller group of Hinchliffe Outlaws and here they are. At the far left is outlaw leader, Clay Allinson. I am aware that there was a real life Old West gunfighter called Clay Allison but it is pure coincidence that they share similar names. When I ran my Outlaw Campaign in the 1980's using my 54mm scale figures, Clay was my player character and leader of a gang of brutal and sadistic killers. My players really enjoyed playing bad guys and getting away with murder and mayhem. The campaign ended abruptly when the gang decided to rob a Mexican bank and just about everything that could go wrong did go wrong. Most of the gang were killed. Some were arrested after being wounded including Clay. He was imprisoned for a long time. Others who were arrested faced the hangman's noose. I guess it was a fitting end as it proved crime does not pay. 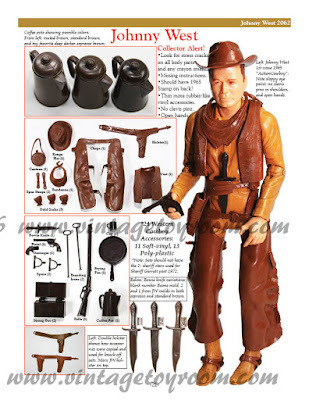 This figure is an almost exact copy of the Airfix Cowboy figure that I used to portray Clay. Clay is armed with two Colt .45 Peacemaker Pistols. Clay's best friend for many a year was "Mad Jack" Duncan, a crazed psychopath who did some unspeakable things in my campaign. In my campaign that I mentioned above he suffered numerous wounds in the final battle, was easily arrested and swiftly hung. He is armed with a Colt .45 Peacemaker Pistol, a 12 Gauge Scattergun and a Bowie Knife. Note this figure is not produced by Hinchliffe. 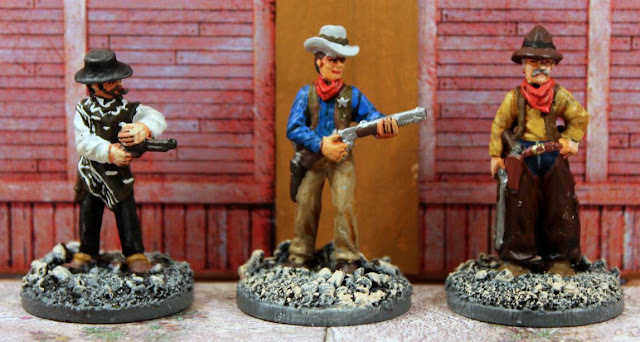 He is a plastic toy that I got from a Christmas cracker and he is a perfect 28mm scale copy of the Airfix Cowboy that was used by one of my players in the campaign. I made two alterations to both 54mm and 28mm scale figures of "Mad Jack" and that was to convert his Winchester Rifle into a Double-Barrelled Scattergun and to add his Bowie Knife to the back of his belt. Next in line is Frank Harlan, who did not take part in my old Outlaws campaign. However, he is going to be part of Clay's new gang when I introduce them to my Six Gun Sound campaign. Frank is 42 years old and looking for one big score so that he can retire and settle down. He is a reliable ally with nerves of steel. He is armed with a Colt .44 Army Pistol. Last up, is new recruit, Adam "Rustler" Madden, who at 23 years of age is the youngest member of the gang. He is an expert rider and very good with horses. "Rustler" is armed with a Colt .44 army Pistol and a Knife. I'm looking forward to using this gang in Six Gun Sound, especially as I know Clay and "Mad Jack" so well. It'll be interesting to see how they fare this time around. 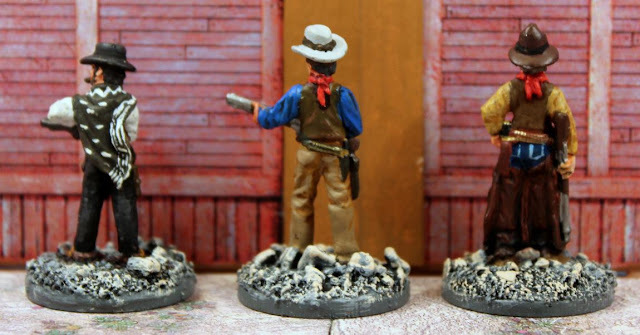 One of the things I've done this month is to rebase and touch up the paintwork of some of my old 28mm scale Wild West figures. I was quite surprised at just how many figures I had from Hinchliffe Models, all now sadly out of production. By far my biggest set were my Mexican Bandidos and it is these I'm going to showcase here. Every one of these figures were based on 54mm scale figures that I own, in terms of names, colour schemes and as near as possible, poses. I have just finished creating Character Record Sheets for them to use in my Six Gun Sound batreps. At the far left is Leon Cordoba, who was one of the gang leaders. Sometimes I used all of the figures in one gang and at other times split them up into smaller gangs. Cordoba is smartly dressed and is armed with a pair of Colt .44 Army Pistols. Next to him is the other figure who was also a gang leader, Emiliano Muerte, whose surname means "death". He is also smartly dressed with gold-trimmed clothing and he is also armed with twin Colt .44 Army Pistols. In the centre of the group is Pachuco "the Bloody". This figure is a conversion of the Muerte figure. I repositioned his left arm and gave him a Winchester Rifle from my spare parts box. I filed off the gold balls from the sides of his trousers. His pistol is a Colt .45 Peacemaker. The kneeling figure is Nino Garcia, who was originally standing up. I reposed him to better match his 54mm scale version. I can't remember if the original figure was bare-headed or not (he probably was) but I do know that I added his sombrero, which I made out of Milliput. He is armed with two Colt .45 Peacemaker Pistols. At the far right is the only figure from this set not made by Hinchliffe Models, but I have included him anyway as he often appeared alongside the others. He is called Juliano Ortega, who is a sadistic homosexual hunchback! I based him on a Dixon Miniatures Confederate Trooper and sculpted on his poncho around his backpack to represent his hunchback. He is armed with a Trapdoor Springfield .45 Rifle and a Colt .44 Army Pistol. The next batch of five are all rank and file footsloggers of average quality and ability. At the far left is Alfredo Esposita, who is armed with a Trapdoor Springfield .45 Rifle, a Smith and Wesson .45 Schofield Pistol and a Bowie Knife. Second from the left is Juan Juose, a conversion of the Alfredo Esposita figure. I repositioned his arms, added a Bowie Knife to his left hand and made his shirt hanging out from his trousers. He is armed similarly to Esposita but his Pistol is a Colt.44 Army model. In the centre is Fernando Almeria, another conversion of Alfredo Esposita. I repositioned his arms so that he is holding his rifle in both hands. He is armed with a Trapdoor Springfield .45 Rifle, a Colt .45 Peacemaker Pistol and a Bowie Knife. Second from the left is Gabriel Valencia, a cowardly man who will happily shoot an opponent in the back but is more likely to run away if charged than stand and fight. He is armed with a Winchester .44 Rifle and a Colt .45 Cavalry Pistol. Finally, is Jose Carrillo, who is a conversion of the Gabriel Valencia figure. I reposed him so that he was kneeling. He is armed with a Winchester .44 Rifle and a Remington .45 Pistol. Hinchliffe Models had a distinctive look about them that made them very recognisable. They were certainly not the best sculpted figures on the market but nor were they the worst and I must admit I liked them. I got into their range almost as soon as I started wargaming seriously in the late 1970's, when I collected some of their Napoleonic figures. Most of my current Mexican Bandidos are made by Black Scorpion, who are far superior sculpts, but even so, I do like these old figures and I most certainly will use them in my Six Gun Sound games. Okay, I'll admit that this is certainly not the most exciting figure review post I've done but here it is any way. A couple of months ago when I was about to run my first Six Gun Sound batrep, I knew that one element that was missing from my Wild West scenery items were unmounted horses. I had loads of hitching posts but no horses, apart from one pack mule, to make use of them. Fortunately, quite a few companies produce figures of horses without a rider, so it was just a question of finding one that best suited my needs. In the end I chose this range of GBA03 Standing Saddle Horses from the Knuckleduster Gunfighters Ball range of 32mm scale Animals. Each pack comes with two horses, one of each of pose and they cost £7.50 for the pair. I ordered three sets to give me six horses. Being 32mm scale, the horses are a nice size, not too big and not too small, and they fit in well with my other Wild West figures. The horses are nicely equipped with saddlebags, blankets, saddles and reins. Note that on the one in the centre I added a small sack made out of Milliput to the saddle. Quite often if I mix up too much Milliput for what I need, I'll use the excess for making little bags like this. These next three horses have their heads bowed and their legs are positioned differently to the previous three. Once again, the horse in the centre has had a small sack added to it. Reading comments from other bloggers it seems that many of you don't like painting horses. I must admit that I thoroughly enjoy painting them. I find them a lot easier to paint than humans. As is usual when painting animals, I refer to Google Images for appropriate colour schemes so that my horses look as realistic as possible. Way back in the early 1990's I bought a boxed set of ten 32mm scale Western Gunfighters produced by Grenadier Miniatures. They were beautifully sculpted by Andy Chernak but at the time were over-scaled as most Wild West figures back then were either 25mm or 28mm scale. Now, however, they are a perfect fit with the majority of my collection of Wild West figures. I have shown one of them - the Gambler - in a previous post (see here - http://vampifansworldoftheundead.blogspot.com/2017/06/assorted-wild-west-gamblers-01.html ). Two of the figures - the Gunfighter and the Rifleman - never got painted and have gone missing. I have no idea where they went. So that leaves just seven to show you and here they are. First up is the easily identifiable Man With No Name as played by Clint Eastwood in the Dollar trilogy of Spaghetti Westerns. I do love this figure but I must admit I was conflicted when I bought the Shadows of Brimstone male Drifter, who was a superb sculpt of The Man With No Name (see here - http://vampifansworldoftheundead.blogspot.com/2017/10/shadows-of-brimstone-heroes-03.html ) as to which one is the best. On reflection, I do think the Shadows of Brimstone version only just edges this Grenadier version. 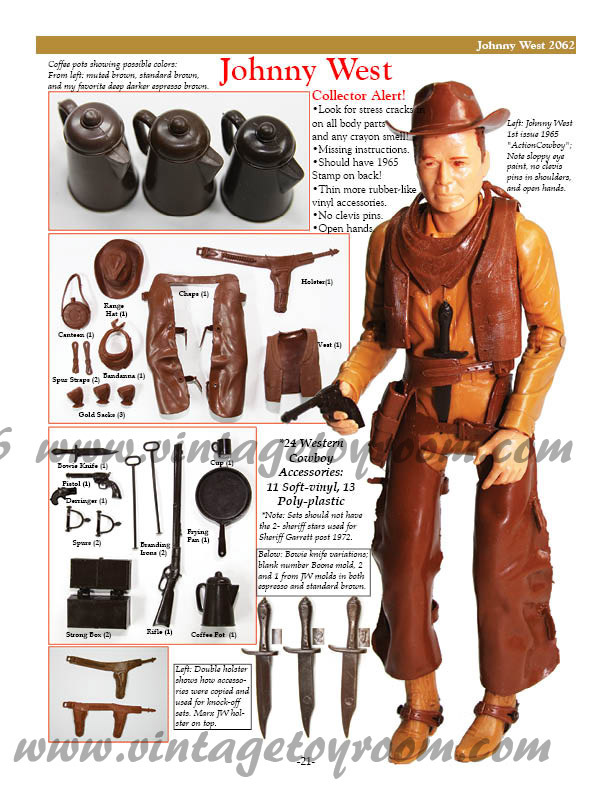 The boxed set lists him as a Range Rider and not a Bounty Hunter. It also shows him in an alternate colour scheme, which I may use if I decide to repaint him. It is a distinct possibility because I don't want two versions of the same character. In the centre is the U.S. Marshal whom I have named as "the Duke" due to his uncanny resemblance to John Wayne. Note the way he is cocking the lever of his Winchester Rifle - a nice touch. At the far right is the Cowpoke, whom I named Johnny West. 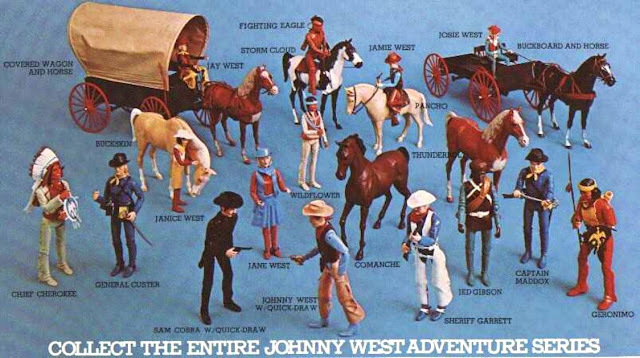 When I was a young lad growing up in the 1960's my parents bought me a 12" action figure of a cowboy called Johnny West as a Christmas present (see below). This figure reminded me of him so much and so I had to name him Johnny West. Johnny will be a recurring character in my Six Gun Sound campaign, although not as a Cowboy. Most likely, he'll be a Bounty Hunter or a Gunfighter. Johnny is armed with a Winchester .44 Rifle, Colt .45 Peacemaker Revolver, .41 Derringer Pistol and Bowie Knife, just as his taller version is. 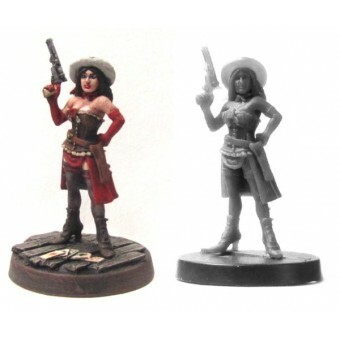 Moving on is Saloon Girl Madeleine DuBois, who is described as being "vivacious" by Grenadier Miniatures. Yep, that's a good description of her. She works for Bartender Guthrie Fullwright, who is an expert gambler. He is armed with a 12 Gauge Scattergun, which he keeps behind the bar to deal with troublemakers. Last up are the two outlaws. Second from the right is Mexican bandida, "Hole in Juan" Gomez, who is armed with a pair of Colt .44 Army Revolvers and a Knife. He is a crackshot pistolero. Finally, is young Bank Robber Gil Hardy, who goes by the nickname of "The Cheyenne Kid". He is left-handed and is armed with a Colt .45 Peacemaker Revolver. Sadly, this set is long out of production. I think it would sell very well if it was re-released today as all of the figures are superbly sculpted and because of their size will fit in so well with so many other ranges. To the left of here is this wonderful picture of 12" action figure, Johnny West, showing him and all of his accessories that came with him. This figure was produced in 1965. I still have mine but some of his accessories have gone missing. In the same year as I received this figure, my brother got the 12" action figure of Chief Cherokee and a horse to go with him as his Christmas present. I also got a horse who was named Thunderbolt and my brother's horse was named Comanche. Note that unlike the humans, the horses were not pose-able. These figures were made by the Louis Marx company. The Johnny West range of figures were very popular. In later years, Johnny gained a family, wife Jane, daughters Janice and Josie, and sons Jay and Jamie. Chief Cherokee also gained a family - his wife was Princess Wildflower. Other figures like Sheriff Garrett and Outlaw Sam Cobra were added to the range but my brother and I never got any of the others. Below is the complete range of figures. If they were sold now I'd definitely want them all but whether I could afford them is another matter entirely. I have always been a big fan of Western films and I still am. 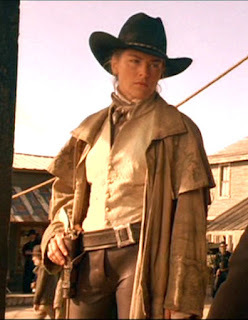 In recent years I've noticed that more and more Westerns are featuring females in the starring roles, and this is a good thing in my opinion. I have already shown the two heroines from the film, Bandidos in action in my first Six Gun Sound batrep. 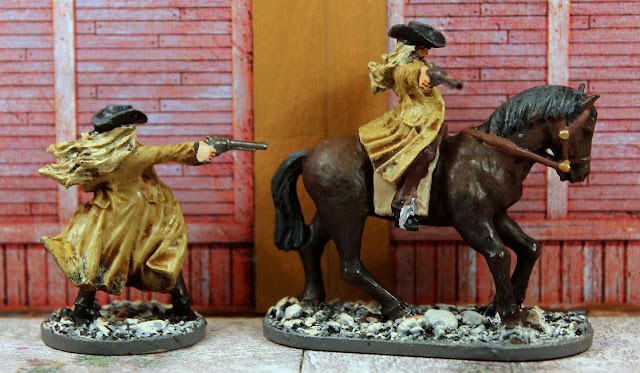 In this post I want to show the figures I've collected for two more of my favourite Westerns - Bad Girls and The Quick and the Dead. Bad Girls was made in 1994 and very briefly the film follows four former prostitutes on the run following a justifiable homicide and prison escape, who later encounter difficulties involving a bank robbery, a train robbery and being chased by Pinkerton detectives. The four Bad Girls who aren't really that bad. In this still from the film are the four Bad Girls, who are from left to right, Eileen Spenser (played by Andie MacDowell), Anita Crown (played by Mary Stuart Masterson), Cody Zamora (played by Madeleine Stowe) and Lily Laronette (played by Drew Barrymore). These are the figures I've used to represent the gang and they all came from different companies. At the far left is the gang's leader, Cody Zamora. Cody is based on the Reaper Chronoscope figure, 50111 Diamond Sue Dawson, who costs £5.22 from the Miniature Heroes webstore. Diamond Sue Dawson was far too good a name not to use, so one of my Black Scorpion Tombstone ladies has adopted that name. Next up is Eileen Spenser and her figure came from the Knuckleduster Gunfighter's Ball range and is GBF37 - Elly. I added her waistcoat, made out of Milliput, which was a really simple conversion. Her figure costs £3.50 from the Caliver Books webstore. Second from the right is Anita Crown, and she was produced by Black Scorpion as one of four figures in the Tombstone Cowgirls 1 set, which sadly was just withdrawn from sale at the beginning of this month. I suspect that was because the new range of Tombstone Females were released at the same time, but that seems like a strange decision to me. Surely more choice is a good thing? I do wonder if these older figures will ever return? If not, that is a sad thing, but I'm glad I bought mine when I did. The last figure in line is Lily Laronette produced by Belt Fed Gaming in foot and mounted versions. I've already shown her once before in this post, https://vampifansworldoftheundead.blogspot.com/2018/05/belt-fed-wild-west-ladies-01.html However, she is worth showing again, only this time with her three cohorts. I have created stat cards for these four to use in my Six Gun Sound games. I feel a team up with my two ladies from Bandidos would make for a fun game. Another strong female lead who greatly impressed me was Sharon Stone's character known only as "The Lady" or Ellen from the 1995 film, The Quick and the Dead. The story focuses on "The Lady", a gunfighter who rides into the frontier town of Redemption controlled by corrupt mayor John Herod (played by Gene Hackman). She joins a deadly duelling competition in an attempt to exact revenge for the death of her father by Herod. "The Lady" character is a popular figure for sculptors of Wild West miniatures. I know of three such figures and there may well be more. Probably the most well known of them is the Reaper Chronoscope figure - 50003 Cowgirl Ellen Stone. I do like how they have combined Sharon's surname with the character's first name. The only thing that prevented me from using that figure as "The Lady" was the fact that she was armed with a double-barrelled scattergun, which she never used in the film. However, the figure I have chosen for my own Ellen Stone (somehow that name is so appropriate for her) is this new release from Black Scorpion. 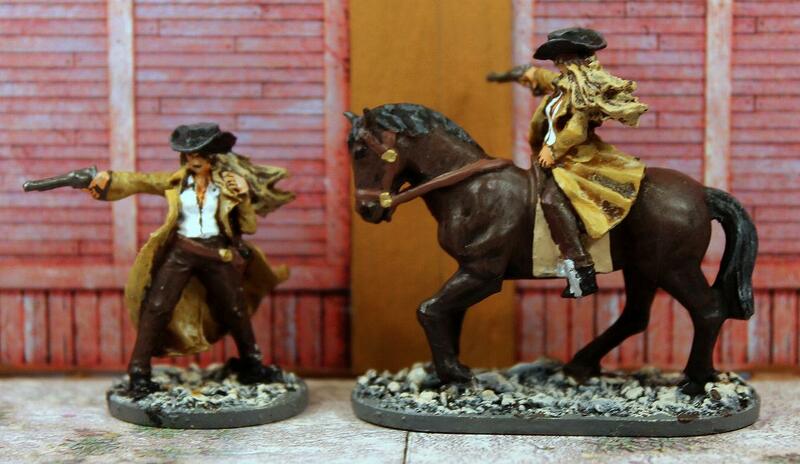 This is the female leader on foot and mounted from the Female Faction of the recent Tombstone Kickstarter range. I backed this project as soon as it was launched last year. As soon as I saw this figure, I knew that I wanted to use her as "The Lady". I copied her colour scheme from the photo shown above. All of the leaders of the seven factions from the Tombstone skirmish game come in foot and mounted versions, which I do like a lot. This is a fantastic sculpt, very animated and a darned good likeness of Sharon Stone. As I said earlier, the female faction has only just gone on sale at the start of this month and the foot version of the female leader costs £4.50 and the mounted version costs £9.50. Expensive, I know, but they are high quality resin sculpts, full of detail. As soon as I saw that Flying Frog Productions were bringing out a new boxed set of figures called Undead Outlaws for Shadows of Brimstone I knew I wanted them. I bought my set from an eBay seller for a much cheaper price than buying them direct from the Flying Frog webstore. Plus postage was free and I had no customs charges to worry about. A win-win deal! These are actually smart zombies, in that they have retained the memory of how to fire a gun, much like the Smartie Zombies in High Moon. Outlaws are a common occurrence throughout the region around the ruins of Brimstone. Even before the town blew up and the portals began to open, the gold rush and Dark Stone rush that grew the town out of control also lured in outlaws and bandits by the thousands. Once the devastation occurred and the Darkness came, countless number of these outlaws fell into shadow. Some became mutants, others fell to the curse of the Lycan or began meddling in dark Magiks, and many more began to rise from the grave as Undead. It wasn't long before the Undead Outlaws fell back into their old ways of robbing, rustling and mayhem. Perhaps it was just faint memories of their old lives seeping back in, or maybe they have a cold purpose, with a mind for revenge on the land of the living. The most famous of all is a dark, rotting figure known only as the Undead Gunslinger. Whoever he was in life, no one can say for sure. But in death, he has become the most cold killer in the land, earning the nickname of the "Fastest Dead in the West". He travels the roads and shadows, challenging any who cross his path to a duel. Few survive to tell the tale. Feared for his quick draw, his cold silence and his sinister stare, the Undead Gunslinger is an unstoppable force, back from Hell and hungry for revenge. As a Legendary Enemy, the Undead Gunslinger is a dangerous foe to face. He is capable of dealing out horrendous amounts of damage with his six-shooters, using special Deadman's Shots bullets to terrorise his opponents. I think it's safe to say, he is clearly based on Clint Eastwood's "The Man With No Name" from the Dollar trilogy of films. He is a superb sculpt in a very dramatic pose, with his ragged poncho flowing in the wind behind him. With his cheroot clamped in his mouth he just exudes menace as he fires away with both guns blazing. The other three Undead Outlaws are all the same sculpt. However, they came with separate left arms, so by gluing them on in different positions I was able to make each one look unique. Varied paint jobs helped to differentiate them even further. Thieves, rustlers and robbers in life, these Undead Outlaws have returned from the grave to bring death to the world of the living. Memories of their past lives have lead them to continue the life of the outlaw, robbing banks and trains, and gunning down any who would stand in their way. Undead Outlaws are predominantly Ranged Enemies that have the Shootout Standard Ability to guide how they move and attack each turn. As Undead, they also have high Defence and are fearsome Enemies to engage in a firefight. These three figures were all identical one-piece sculpts. The one at the far left is the original sculpt. For the other two, I cut off their left arms and repositioned them so that each outlaw looks unique. I don't like having multiple figures all in exactly the same pose. Although designed for use in Shadows of Brimstone, I will most certainly be using this set in my High Moon games as well. I am absolutely delighted with this set. The Undead Outlaws boxed set of seven 32mm scale figures costs $39.95 from the Flying Frog webstore plus a minimum $24.00 postage and whatever charges Customs and Excise want to extort you for and you can see why I opted for eBay. There is currently a set on eBay for sale at £34.86 plus free post and packing if any one is interested. It's dearer than what I paid, but still a good price. Better still, Amazon UK have 12 sets in stock for sale at £33.72.